Mist and Wipes were first invented by Meguiars for show cars when the vehicle couldn't be washed before paint judging. Just spray on and wipe safely & brilliantly clean. The idea is to wet and lubricate the soil (including abrasive dust) before attempting to wipe it off. Also a great lubricant for any clay bar. 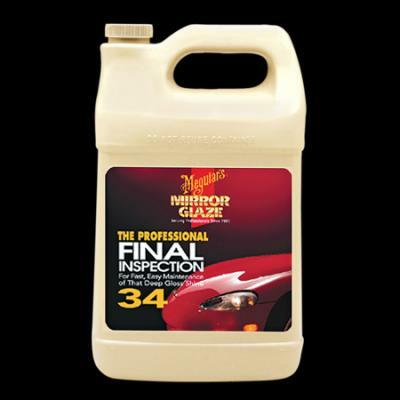 Final Inspection® is a fast, mist-on, wipe-off detailer for a "Show Car Shine." Its high lubricity formula removes dust, fingerprints, light contaminants and is ideal to evaluate paint repairs, or to look for surface defects. Its paintable, body shop safe formula is the perfect product for use before customer delivery.